Windows users who switch to Windows 8 when the operating system comes out may face issues changing the computer's power state at first. 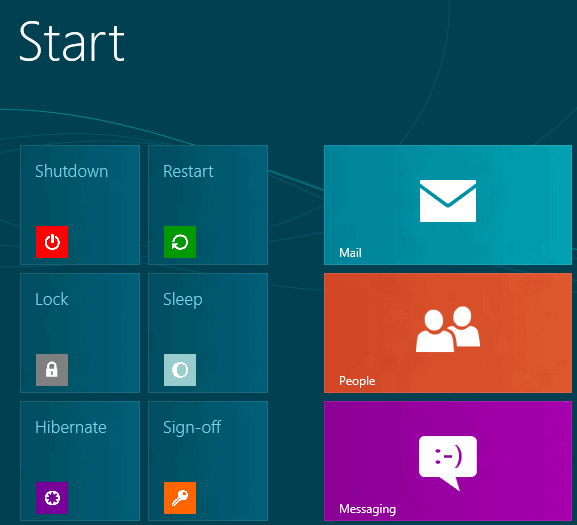 With the start menu gone, the most frequently used option to shutdown, restart or hibernate / sleep is not available anymore. And while others have been added, like using Windows-C to bring up the Charms menu, clicking on settings, then on power, and then on shutdown, sleep or restart, they are not really that comfortable to reach. In Metro, some of the options to change the system's power state are not available. You can for instance not use Alt-F4 to bring up the shutdown menu. The free program SystemPowerShortcuts adds power shortcuts to the Metro interface that can be activated with a single-click of the mouse button. Please note that Windows 8 may display a warning message during installation using its SmartScreen technology. Here you need to click on More to bring up the option to continue with the installation of the program. See How To Bypass SmartScreen Filter (Windows Protected Your PC) In Windows 8 for additional information about this technology and how to bypass this. You can naturally remove any of them with a right-click on the tile and selecting to remove it from the start screen. Another option that you have is to move them to another location, for instance further to the left to access them without having to scroll around first. The System Power Shortcut displays an alternative screen where all power options are displayed again. This is not that spectacular, but there is also an option to configure an automatic shutdown of the system at a specific time. Please note that the program requires the Microsoft .Net Framework 4.0. According to the author, it is compatible not only with Windows 8, but also with Windows 7. Another add-on required to restore a basic function for a PC/notebook. Soon all the add-on code required to give Win-8 the usability of Win-95-Win-7 will rival that of the OS itself. What a turkey it is proving to be. All because M$ wants to force all of us PC using square pegs into its tablet/phone OS round hole.